There were lots of school parties visiting the islands, but I suppose that is to be expected during school time in the week. There were 3 decks on the ferries, 2 inside and the top one outside, so we went right to the top to get a good view. We did get a good view, but there was a cold breeze which made it even colder outside. The trip over to Liberty Island was good for taking photos of the 2 islands, and luckily as we got closer the mist cleared so we could get some better pictures. 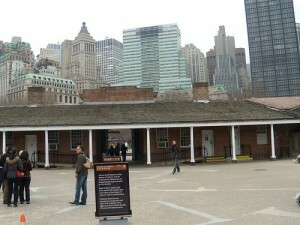 We arrived at Liberty Island and disembarked and began to make our way around the island. 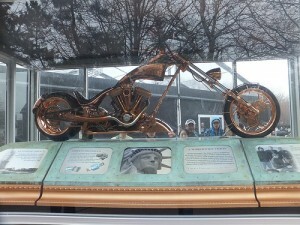 One thing that is worth seeing at the moment is motorbike made to commemorate the 125th anniversary of the Statue of Liberty made by the American Chopper programme. 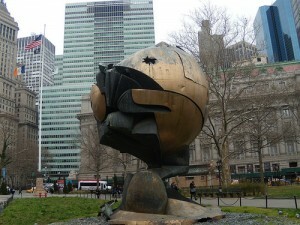 Unfortunately, a lot of Liberty Island is a building site at the moment due to renovations, so there’s not really much to see apart from the statue herself. I was a bit surprised when I saw the statue, as I expected her to be taller, she is tall, but she’s not much taller than the pedestal she sits on. 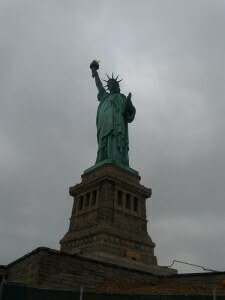 Anyhow, we made our way round the island, snapping away as we walked round, and we got some great pictures of the Statue. 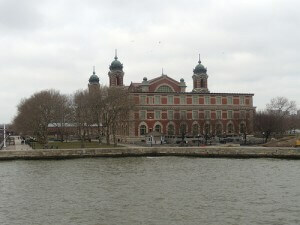 We were soon back at the landing stage, and after having a look in the gift shop, we decided to carry on to Ellis Island. 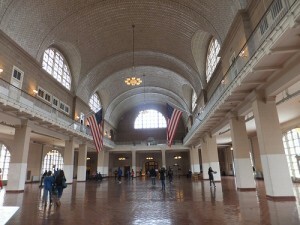 I would say that if you are in a rush, until all renovations are done, you could probably stay on the ferry and get your photos from there, and just get off at Ellis Island. Next stop – Ellis Island, again there was a lot of building work going on here, but the main reason for visiting, the museum was still open. I found the museum very interesting. Standing in the main hall and just thinking about all the thousands and thousands of people who had come through there made you pause for a moment. Of all the millions of people who came through Ellis Island over the years, only 2% were turned away, which I found amazing, I thought it would have been a lot higher, like it would be today. There were a lot of exhibits to see in the museum, there were walls that had been restored to reveal the graffiti that some of the people who came through left, there were also recordings of immigrants stories amongst many other things. We spent a good couple of hours looking around the museum and taking it all in, and then headed back for the ferry. On the way back to Battery Park we had a good opportunity to get some pictures of the New York skyline, and I also got some pictures of the Staten Island Ferry as it passed by. We got back to the terminal, and I considered looking round the area and maybe having a trip on the Staten Island Ferry, but by this time Aidan was feeling cold, and both our feet were aching a bit, so instead we decided to just get the subway back to our hotel. After resting our feet for a while and warming up, we decided to venture out for something to eat again. This time we came across a diner called the Brooklyn Diner which was just off 7th Avenue, which again seemed to get good reviews, so we decided to give it ago. I think we benefited from going out for dinner very early (between 3 & 5 in the afternoon), as we always managed to get seated straight away, whereas if we’d waited until later in the evening they would have been much busier. For our meals today, Aidan chose the Deluxe Cheeseburger, which apparently was the “best burger in New York”, or so the menu said, which as usual was huge, and he seemed to enjoy it. I originally wanted the chicken pot pie, but unfortunately, they had run out (the menu did say it runs out quickly, so I wasn’t too disappointed). So I decided to have Cuban Chicken instead, which I’d never had before. The chicken was very nice, and came with plantain chips, and rice and beans. It was very nice, but was very spicy. I also treated myself to a Brooklyn lager, which was darker than normal lager, but enjoyable nether the less. We decided to have some dessert today as well, but I can’t remember what we had (it must have been the beer I had) I think I had another hot fudge Sundae, but I can’t remember what Aidan had. After finishing dinner we thought we’d do some shopping, so we had a walk down 7th avenue. 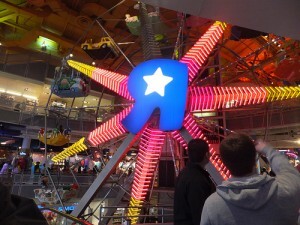 We called into Toys R Us, and spent a good half hour looking around – I’ve never been in a shop with a full size Ferris wheel before! I had my photo taken with a full size picture of Master Chief from Halo made from megablocks! Aidan had a good look through all the electronics they had as well. They also had Iron Man and Spider-man posing for photos with the kids visiting too. We then slowly walked back towards our hotel and called into a couple of the gift shops and bought a few things for the family, we also called into the M&M’s megastore and got a bag of pretzel M&M’s and Peanut Butter M&M’s as presents, as I don’t think you can get these in the UK. Got a few more than I intended, when I pulled the lever on the dispenser a big pile of them when into my bag before I could let go! Our final stop was the Hershey’s shop next to our hotel, but that was a bit of a disappointment, I thought it might have more floors, but it turned out that the little corner store you go into from the street is all there was. We then called into the nearest Duane Reade to stock up on drinks and then went back to our hotel for the night. This entry was posted in Out and About and tagged Burgers, Desserts, Ellis Island, Food and Drink, New Jersey, New York, Statue of Liberty, Yummy by Paul_E. Bookmark the permalink.